Sheikh Mahmoud Abou al-Qa'qa, also known as Mahmud Gul Aghassi, a radical Syrian imam with thousands of followers, was assassinated in Aleppo, in northern Syria, after Friday prayers. In this post, various reports of the assassination, detailed and otherwise, with a few comments and a touch of emphasis added. DAMASCUS : The imam of a Syrian mosque who repeatedly called for holy war against US forces was shot dead after Friday prayers, witnesses and medical sources said. A gunman stepped from a car and opened fire with an automatic weapon outside his mosque in the northern city of Aleppo, witnesses said. The preacher was hit in the head and stomach and died later in hospital. A Syrian cleric who recruited young Muslims to fight U.S.-led forces in Iraq was assassinated in the northern Syrian city of Aleppo on Friday, his aides said. Sheikh Mahmoud Abou al-Qa'qa was shot dead after he emerged from Friday prayers, they told Reuters. "A man fired several bullets into the Sheikh's chest. A crowd chased him and he was eventually caught. He is now with the authorities under custody," said Ahmad Haidar, one of the aides to the young cleric. "Sheikh Qa'qa died in hospital. His killers do not want Muslims to unite." Syrian sources said the killer was in his 20s. Qa'qa had thousands of followers and operated from Aleppo. He had called for jihad to counter U.S. policies against Syria. Qa'qa disappeared from Aleppo last year. He returned this year and became head of a religious school. He led prayers at a mosque in the northern part of the city. "I challenge anyone to prove that I had ever called for unlawful resistance or indiscriminate violence against any country," Qa'qa once said. "Our hearts are filled with joy when we hear about any resistance operations in Iraq against the American invaders. We ask people to keep praying to God to help achieve victory for Iraq against the US," Qa'qa was quoted as saying late 2003 by The Christian Science Monitor. He also called for an Islamic state based on sharia law in Syria. A Syrian cleric, Sheikh Mahmoud Abou al-Qaqa, has been shot dead in the northern Syrian city of Aleppo after Friday prayers. It has been widely reported that he was suspected of recruiting foreign fighters to travel to Iraq. The cleric was killed as he was leaving Friday prayers in a Mosque in the northern Syrian city of Aleppo. An unidentified man fired several bullets into his chest. After a chase the gunman was arrested by the Syrian authorities. Sheikh Abou al-Qaqa was widely reported to have been involved in the recruitment and training of foreign fighters destined for Iraq. The cleric always denied any involvement with the insurgency. DAMASCUS, Syria: A Sunni Muslim cleric who in the past has been suspected of recruiting militants to fight in Iraq was shot dead as he left a mosque after Friday prayers in the northern city of Aleppo, aides said. Mohammed Gul Aghassi, 34, was instantly killed by a gunman who pumped five bullets into his body as he left the Imam Mosque where he regularly preaches after the noon prayers. The aide, Ahmed Sadeq, told The Associated Press that he pursued the gunman and captured him, handing him over to authorities. Sadeq accused "terrorists" of killing Aghassi for his "nationalist positions." He did not elaborate. Sheik Samir Mohammed Ghazal Abu Khashbeh, another aide to the slain cleric, said the gunman fled in a waiting pickup truck and he was chased and arrested along with the driver. He said two worshippers who happened to be nearby were shot and wounded, one in the leg and one in the pelvis. Abu Khashbeh said the attacker told him he shot the cleric "because he (Aghassi) was an agent of the Americans." "The one who carried out the assassination was a prisoner of the American forces in Iraq and has been released some time ago. He is known to us," Abou Khashbeh told AP. Such attacks are uncommon in Syria, a country where security is generally tight. But Syrian security forces have occasionally clashed with Islamic militants. Aghassi, also known as Abu Qa'qa', headed a theology school in Aleppo, Syria's second-largest city. Western media in 2005 cited interviews with Sunni insurgents saying that he was a prominent figure in recruiting Arab fighters and helping funnel them into Iraq to fight U.S. and Iraqi troops. Some of the insurgents in the reports raised suspicions he was also informing Syrian security about the movements. Aghassi denied any links to networks taking insurgents into Iraq. In June 2006, Syrian anti-terrorism police fought Islamic militants near the Defense Ministry on Friday in a gunbattle that killed five people and wounded four. CD-ROMs of Aghassi's speeches were found on the fighters but the cleric denied then he had any links to that group of extremists. Syria has been accused by the United States of not doing enough to stem the flow of militants across its desert border with Iraq. Aleppo: A Syrian cleric suspected of recruiting militants for Iraq has been shot dead in the northern city of Aleppo, his aides have said. Shaikh Mahmoud Abu Al Qaqaa was shot to death several times as he left the Imam Mosque after Friday prayers. The gunman, who tried to flee the scene of the shooting, has been arrested. One of his aides said that "terrorists" killed the cleric for his "nationalist positions". Al Qaqaa was popular with radical Islamist followers in Syria because of his anti-American sermons. In June 2006, authorities have found CDs of Al Qaqaa's sermons in which he called for US forces in the Middle East to be slaughtered "like cattle". DAMASCUS - The imam of a Syrian mosque who repeatedly called for holy war against US forces was shot dead after Friday prayers, witnesses and medical sources said. Mahmud Gul Aghassi, also known as Abu Al-Qaaqaa, was killed by a gunman who stepped from a car and opened fire with an automatic weapon outside his mosque in the northern city of Aleppo, witnesses said. The preacher was hit in the head and stomach and died some hours later in Aleppo's al Shaaba hospital, according to a medical source at the hospital. Three people with him were wounded in the attack. Witnesses said one of his attackers was detained by the imam's followers. Al-Qaaqaa was known for his anti-American views and recordings calling for holy war against US forces, and had set up a group which recruited young men to fight coalition forces in Iraq. He had recently fallen foul of fellow jihadists, however, for allegedly colluding with the Syrian regime of President Bashar al-Assad, and several extremist websites had called for his assassination. DAMASCUS - A Syrian cleric who recruited insurgents to fight US-led forces in Iraq was assassinated in the northern Syrian city of Aleppo on Friday, his aides said. Sheikh Mahmoud Abou Al QadaSheikh Mahmoud Abou Al Qaqa was shot dead after he emerged from Friday prayers, they told Reuters. “A man fired several bullets into the Sheikh’s chest. A crowd chased him and he was eventually caught. He is now with the authorities under custody,” said Ahmad Haidar, one of the aides to the young cleric. Qaqa had thousands of followers and operated in the mysterious world of Islamist movements in Aleppo, a once liberal trading hub that has become more religious in recent years. He had called for jihad, or holy war, to counter US policies against Syria. Experts say he had toned down his rhetoric lately and become less active. Qaqa disappeared from Aleppo last year. He returned this year and became head of a religious school. He led prayers at a mosque in the northern part of the city. “I challenge anyone to prove that I had ever called for unlawful resistance or indiscriminate violence against any country,” Qaqa once said. Syrian writer Shaban Aboud said Qaqa was virtually unknown before the 2003 US-led invasion of Iraq that removed Saddam Hussein from power and ushered sectarian strife. “The invasion and the shock it left among youth made him a star. Thousands began going to the mosque he led to listen to his fiery speeches. Qaqa emphasised he was not against the state,” Aboud wrote last year in the Lebanese An-Nahar daily. “A handsome man skilful in speech and debate, Qaqa inspired Jihadists who made reaching Iraq and fighting the occupation forces their goal,” he said. The Syrian government is accused by Washington and the pro-US government in Baghdad of helping foreign fighters behind sectarian killings and attacks on US soldiers. Damascus denies helping rebels. Syria has been ruled by the Baath Party since 1963 and is a tightly controlled country. A Syrian cleric suspected of recruiting foreign militants to fight in Iraq has been shot dead in the northern Syrian city of Aleppo, his aides have said. Sheikh Mahmoud Abu al-Qaqaa was shot several times by a gunman as he left the Imam Mosque after Friday prayers. The gunman tried to flee the scene of the shooting, but was chased by a crowd and later arrested, the aides said. Correspondents say Abu al-Qaqaa was a charismatic Sunni cleric with thousands of radical Islamist followers in Syria. His anti-American sermons attracted a wide audience after the US-led invasion in Iraq in 2003, and his reputation rapidly spread. The BBC's Kim Ghattas, who has interviewed the sheikh, notes that assassinations are highly unusual in Syria. She says there are a number of stories concerning why he was killed, some of them contradictory, but adds that he does appear to have been instrumental in channelling jihadis into Iraq. After the shooting, one aide to the cleric told the Associated Press that "terrorists" had killed the sheikh, whose real name was Mahmoud Qul Aghassi, for his "nationalist positions". Another aide, Sheikh Samir Abu Khashbeh, said the gunman had told him that he had killed the cleric "because he was an agent of the Americans". "The one who carried out the assassination was a prisoner of the American forces in Iraq and had been released some time ago," Abu Khashbeh said. "He is known to us." In June 2006, a group of militants killed while attempting to carry out an attack in the capital, Damascus, were found to be carrying CDs of sermons by Abu al-Qaqaa in which he called for US forces in the Middle East to be slaughtered "like cattle". Afterwards, the sheikh denied he had called on Syrians to go to war in Iraq. Others have claimed that Abu al-Qaqaa was an agent of the Syrian government, who was used to appease rising anti-American discontent amongst the country's Muslims and to keep the authorities informed of the activities of his fellow jihadists. Abu al-Qaqaa is said to have kept a low profile in the last year since he was appointed head of a religious school by the Syrian government and he did not openly criticise the authorities. The Syrian government has yet to make an official statement about the incident. DAMASCUS (AFP) — The imam of a Syrian mosque who repeatedly called for holy war against US forces was shot dead after Friday prayers, witnesses and medical sources said. The Reputed Mentor of Fatah al-Islam and other notorious Islamist terrorists operating in Lebanon and Iraq was gunned down in Syria Friday. Mahmoud Gul Aghasi, a Kurd who goes by the name of Abu al-Qaaqaa, was killed by a gunman who stepped out of a car and opened fire at him from an automatic weapon as he walked out of a mosque in the northern Syrian city of Aleppo after Friday noon prayers, according to an Agence France Presse report attributed to witnesses and medical sources. Aghasi was hit in the head and stomach and passed away a few hours later in Aleppo's al Shaaba hospital, according to a medical source at the hospital. Three people with him were wounded in the attack. Witnesses said one of his attackers was detained by Aghasi's followers. 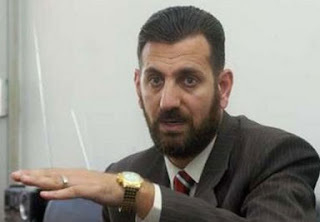 Al-Qaaqaa was known for his anti-American views and recordings calling for holy war against U.S. forces, and had set up a group which recruited young men to fight coalition forces in Iraq. He had recently fallen foul of fellow jihadists, however, for allegedly colluding with the Syrian regime of President Bashar Assad, and several extremist websites had called for his assassination. Al-Qaaqaa, according to reliable sources, was responsible for preaching the radical doctrine to Jihadi recruits at a camp in Syria before dispatching them to fight in Iraq, and most recently in Lebanon. The sources said al-Qaaqaa was the God Father of Fatah al-Islam militants and their terrorist mastermind Shaker Abssi, who remains at large in north Lebanon after the army finished off his group in a 106-day battle in Nahr a-Bared on Set. 2. Syria's Islamic institute, Qarba al-Sham, has accused the US and the Zionist Regime of assassinating their chief, Sheikh Abou al-Qaqa. Mahmoud Qul Aghassi, known as Sheikh Abou al-Qaqa, a senior cleric, was shot dead by two assassins in the northern Syrian city of Aleppo, after he emerged from the Friday prayers, which he had been leading. "Aghassi didn't have any enemies. His only enemies were the United States and the Zionist Regime, against whom he called on his followers to assemble," Sheikh Samir Abu Khashbeh, one of the institute's authorities, said. "The ones who carried out the assassination have been arrested by Syrian security forces, and preliminary research shows them to be connected with foreign states," Abu Khashbeh said. "They are known to us." However, he did not release any information on the terrorists' identities. A year ago, al-Arabia, a pro-west Saudi news channel, had accused Aghassi of supporting al-Qaeda and recruiting Syrian youths to travel to Iraq and fight US-led forces. While pressing charges on al-Arabia for its false claims, the sheikh denied all accusations and stressed that he was against al-Qaeda actions.